Sharing feelings with a romantic partner can be difficult, but it's also necessary in a healthy relationship. Dating coach Lori Gorshow has the answers to your burning questions about how to communicate effectively emotions to a significant other. Dating or married couples spend a lot of time together and care about each other's feelings and opinions on a variety of topics. Some of this communication is lighthearted and about outside people or factors while some of it relates directly to the relationship. Take a balanced approach to communication by expressing positive and negative feelings about general topics and your relationship rather than making every conversation about one topic. "Usually, when couples talk about 'sharing feelings' they are referring to talking about problems," says Lori. While problem-solving is one aspect of a romantic relationship, Lori believes, "If the only time you're sharing feelings is when there is a problem or concern, then both you and your partner will come to have a negative feeling when one of you says 'we need to have a talk.'" Her suggestion for eliminating this unpleasant feeling about conversations is to share feelings on a daily basis. Once you've figured out how to express yourselves, you develop a good level of trust that anchors more serious conversations. "Remember that communication is a two-way street, so don't forget to ask your boyfriend for his thoughts about his day," says Lori. Be purposeful in your dialogue by sharing good things about your day regularly and asking your boyfriend or girlfriend to tell you about his or her day. You don't always have to talk about serious topics; sometimes just asking a specific question about friends, work, or family is enough to make your partner feel like they're being heard. Lori suggests targeted questions will garner better responses than open-ended questions. Try questions like, "I know that you had a meeting today with your team, what happened when you did your presentation?" Great communication doesn't happen instantly for all couples; it takes time and effort. When you take care to share your feelings regularly and listen to your partner without judgement, you'll both develop more confidence in each other's ability to be respectful of emotions. "This is how you learn to trust your partner," says Lori. She adds, "As each of you experience confidence sharing something minor with the other, talking about the most difficult problems will not be so hard." After you've developed comfortable dialogue about the positives, you can practice sharing small concerns or fears. In any relationship, there are distractions or personal hurdles that interfere with everyday conversations. This dialogue is an important part of building your relationship, so you should try to create and encourage conversation whenever possible. 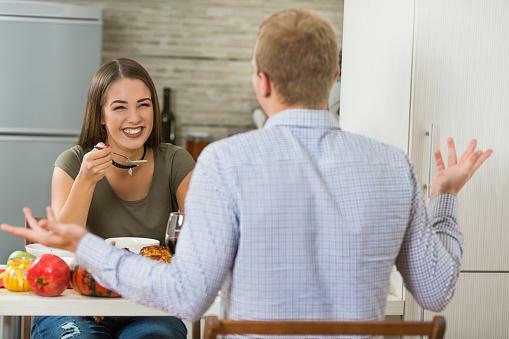 Adult and teen daters can relate to the common scenario where one person in the relationship does most of the talking while the other remains relatively quiet. "Talking in any relationship is a two-way street," Lori shares. If you're the quiet person, she suggests you don't need to be asked to share information about yourself. Instead, "[You] simply need to speak up and voice thoughts, ideas, dreams, etc." Some people base their relationships on the duration, intensity, and depth of their conversations. You might fear short or infrequent conversations will make your partner lose interest in you or indicates the relationship has problems. That's not often the case says Lori. "All relationships ebb and flow. Sometimes couples can talk all night long, and other times it's hard to find anything to talk about." She suggests there are other ways people communicate their feelings aside from talking, like holding hands or smiling at each other. Fill in the blank conversation - Make up a sentence, but leave one word out. Ask your partner to add a word and continue the talk in the same manner. I spy - Look around and describe an object you see. Ask your partner to guess what you're describing. A game you invent together that makes you laugh. Lori points out, "The more you laugh and play together, the closer you'll feel to each other because the two of you are sharing moments that are uniquely your own." Emotions and feelings are incredibly personal. For many people, sharing these thoughts puts them in a vulnerable position, which can be both scary and enriching. 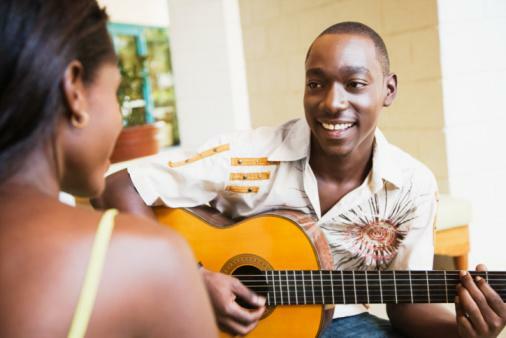 If you're having trouble opening up, start with simple activities that are fun and promote healthy communication. Icebreaker questions aren't only for people meeting for the first time. Grab a list of these scenarios or simple questions about surface topics and feelings to ask each other. You might not make any emotional breakthroughs, but you'll get used to talking about all kinds of subjects and learn interesting facts about each other. Share music and songs that capture your personality, feelings, and life story. Regardless of whether they spark a discussion, they'll give your partner some insight into the deeper parts of your soul. According to research, statements help connect couples more than questions, as do storytelling and showing appreciation. If you can't share your feelings now, tell your partner heartwarming stories from your past as a means to connect emotionally. Read about your astrological signs and compare yourselves to those descriptions. For example, if your guy was born in early December learn how a Sagittarius expresses emotion. Then see how may of those actions are true for him. Write your feelings out in short, sweet love notes or long love letters. The expression of feelings is different for each person and each couple. Examine what works for you and your partner, then start working together to communicate. It may take a bit of trial and error, but with effort every couple can find healthy ways of sharing feelings.